By the time of kick-off on Saturday, just 84 days will have passed since Eden Hazard’s first-half penalty proved enough to win the FA Cup for Chelsea against Jose Mourinho’s increasingly disinterested Manchester United. But with the Extra Preliminary Round of games this weekend, the first steps are taken on the road to Wembley, a full thirteen rounds away for clubs entering at this stage. 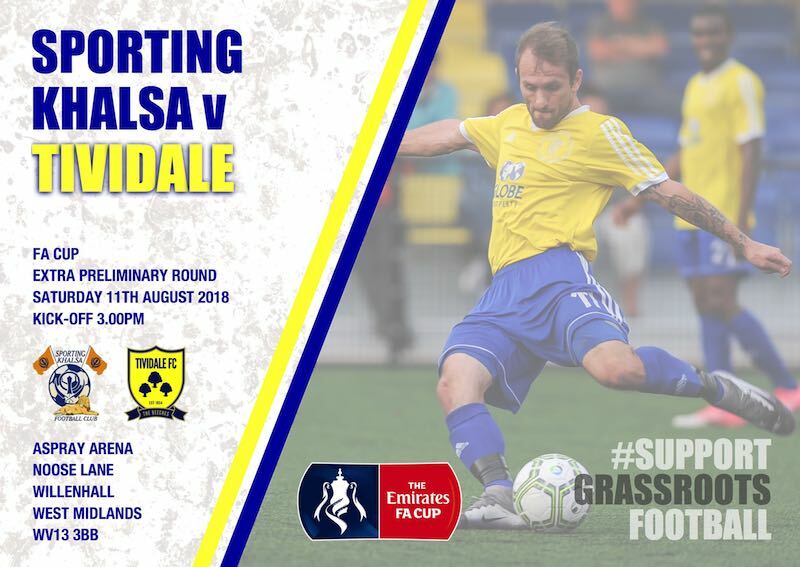 Khalsa will welcome neighbours Tividale on Saturday (kick off 3pm) for what promises to be a crackerjack start to the competition. Although currently in their second season in the West Midlands Regional League – having finished second last year and denied promotion for reasons nobody seems quite clear about but which must not, under any circumstances, be challenged – Dave King’s side have been familiar foes for Khalsa down the years. Last season, Khalsa beat Tividale in the Walsall Senior Cup 3-0 in March thanks to a pair from Mykel Beckley and a goal from Craig Bannister. And the season before, in a season that ultimately ended in relegation for Tivi, the sides battled out a goalless draw at Khalsa and a five-goal thriller finished in favour of Khalsa in the reverse fixture. Tivi started their league campaign in style on Saturday, thumping Smethwick Rangers 5-0 thanks to goals from Demetri Brown (two), Brad Welding, Dan Smith and Tyree Clarke. It is undoubtedly the talented Brown who is the danger man. Formerly with Coventry Sphinx, AFC Wulfrunians and Sutton Coldfield Town, he is now in his third season at the club, having turned down plenty of opportunities to play at a higher level to stay loyal to Tivi. Khalsa, meanwhile, have yet to properly click, picking up just one point out of six in the league having been held 1-1 at Long Eaton on Saturday and then losing 2-0 at home to Highgate on Tuesday night. But, as they say, the cup is a chance to forget all about league form.